1 . Don't doubt the value of short-term missions. To be honest, I was a little skeptical about the value of our one week stay. I knew we would benefit personally by improving our Spanish skills, but I wanted our trip to be of true benefit to the children and staff there; not merely a great cultural experience for us. In the end, I saw that one week is indeed enough time to accomplish beautiful, impactful things: Watching a young boy grasp new ideas and build confidence through simple phonics practice. Seeing the joy in a young girl's eyes because someone is admiring her athletic skills. Being able to speak words of encouragement as young women share about their aspirations for the future. Every day was filled with moments like these! The unbelievably warm, welcoming atmosphere at Lily played a huge part in our ability to connect with the children there. The time went by very fast, but it was filled with so many good things. We were also aware that prior to our stay, a group had been there to do a large scale painting project. Seeing what they had accomplished in a matter of just a few days was absolutely amazing! It spoke volumes about the value of a short-term missions experience. 2 . I need to maintain an open, willing heart. Many years ago, I was involved in residential full time ministry. (That was before things like mortgage payments, health issues and kids' college costs.) In the years that followed, I had become pretty comfortable with the thought that a life of minimal income and physical sacrifice was fine when circumstances "allowed it". Were my notions ever jarred by meeting Papa Ed and Mama Rosa! I am deeply challenged by their dedication to their work and to the children they love. Serving God means being fearful of nothing and holding nothing back. I'm not sure how that should look for our family, but that is definitely how I want us to think and live. May God help us to have truly open, willing hearts and to serve Him with abandon. What was your favorite and least favorite thing about this trip? My favorite thing? The kids!! Talking with them (in my spotty Spanish), working alongside them and having fun while attempting to sharpen academic skills was deeply gratifying. 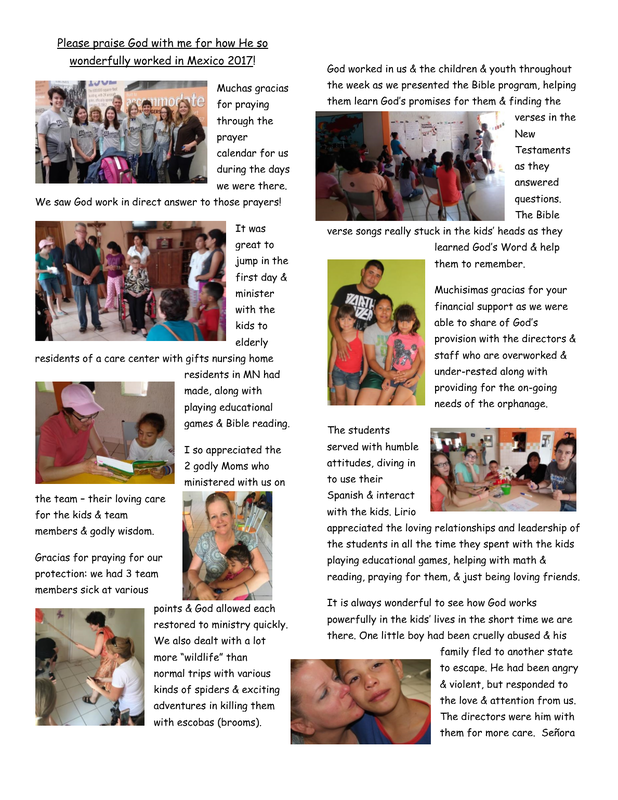 It was so precious to share morning devotions and VBS experiences, too. I was also amazed at how they cared for us; making sure we had enough to eat, seating at meals, other things we needed. That was humbling and beautiful. It was also a blessing to be at Lily with my daughter and to watch her interact. I had feared that perhaps she was too young (13) to make such a trip, but that was not the case. Kids often have a very simple way of finding common ground; they build bridges by just being themselves. I think those bridges sent a message of authenticity about our work, and were truly a joy to observe. It was also such a gift to prepare for the trip and to work side by side as mother and daughter. My least favorite part? Sleeping was a bit difficult, given the heat, some dramatic spider encounters, etc. :) Perhaps a week was just not enough time to fall into a good rhythm with that. It did improve somewhat and God was gracious; we all kept our sense of humor! What do you think about orphans/orphan care? The reality of the need is so heartbreaking. I found myself not able to think too hard about it because I wanted to keep my emotions in check. Time and again I saw examples of how a child's heart longs for individual attention and I just kept thinking, "That's how we are made." Opportunities to give that one on one attention felt like such a privilege. It was beautiful to see the close connections between Papa Ed, Mama Rosa and the children. The kids have such affection for them and I had never closely observed such a large family system. It spoke of that intimate need that children have to be loved individually, and of the determination and selflessness that Mama and Papa have shown daily for so many years. They lay down their lives for the children. It is absolutely amazing and hard to fathom. The Bible clearly instructs that God is a Father to the orphan and that we, His people are to provide for those without an earthly father. There are many ways to do that and spending time with orphans "up close" really drives those truths home. It should also drive us to give in generous and perhaps systematic ways. It must be part of the fabric of our lives. As an American, I probably have a false sense of satisfaction in that our government plays such a large role in caring for the orphan. Visiting Lily puts the worldwide and very spiritual need in the forefront of our minds. I pray that our awareness will only grow. May God help us to see what we can and should do to love those whom He so clearly and dearly loves. It was a great trip! Maybe the best yet. It was a great team willing to serve and love on the kids. Gracias for all your help in preparing us! I think the better picture before going helps with expectations. God was so gracious in giving us strength, stamina, and doing great work in helping man overcome fears. Seriously, we saw God’s power through it all in restoring each one to health and ministry – God is so good! Of course, the kids, jovenes, and staff are always the highlight of the trip. It is amazing how quickly you get attached to all! Communicating in Spanish always helps… We were so happy to be able to bless Papa Ed and Mama Rosa with a two-day retreat to rest as they hadn’t had a day off in a while and are tiring. We were also able to bless the staff each with a gift. God’s provision is perfect. We also saw God’s power shown working in kids’ lives. One little boy, Josue, who had been cruelly abused and behaving violently (6 years-old and can’t read, kicked out of school for violence), soaked in the love and attention we were able to give through Jesus’ love for us. We were able to see him start learning the sound/letter correspondence and gain confidence in his ability to learn. Mama and Papa took him in to their casita to be able to give him more 1:1 attention now. The kids dove into their Bibles to look up verses, answer questions, and hopefully learn more about the promises God has for them – getting His truth in their minds vs. lies of the enemy they hear from the past or others around them. They enjoyed the crafts, games, verse songs, and prizes for saying verses. One special time, was the first day when we went to the asilo with Papa Ed and some of the kids to deliver things made from an asilo/nursing home in MN. I have pics of how we were graciously received there. We also visited the mom with the disabled sons and able to deliver food from Lirio and other gifts to them from the nursing home residents. Memory Care patients here had painted backgrounds on paper and then they had printed verses from our VBS in Spanish to put over them. We left some for the children also. They had also made beaded bracelets and necklaces, lots of little cars for the boys who loved them, educational things like laminated phonics posters of the alphabet and others.